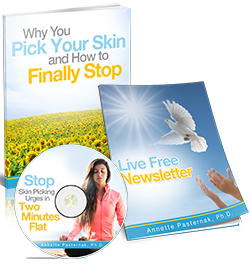 The author and publisher of this Blog (Annette Pasternak) and the accompanying resources and materials have used their best efforts in preparing this Blog. The author and publisher make no representation or warranties with respect to the accuracy, applicability, fitness, or completeness of the contents of this Blog. The information contained in this Blog is strictly for educational and informational purposes. Therefore, if you wish to apply ideas contained in this Blog, you take full responsibility for your actions. 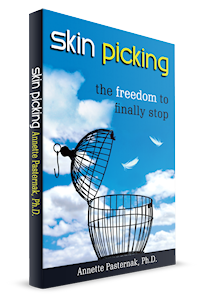 The author and publisher of Stop Skin Picking Coach disclaim any warranties (express or implied), merchantability, or fitness of materials expressed for any particular purpose. The author and publisher shall in no event be held liable to any party for any direct, indirect, punitive, special, incidental or other consequential damages arising directly or indirectly from any use of this material, which is provided as is, and without warranties. This Blog is copyrighted by Annette Pasternak. No part of this may be copied, or changed in any format, sold, or used in any way, online or offline, other than what is outlined within this Blog, under any circumstances without express permission from Annette Pasternak.